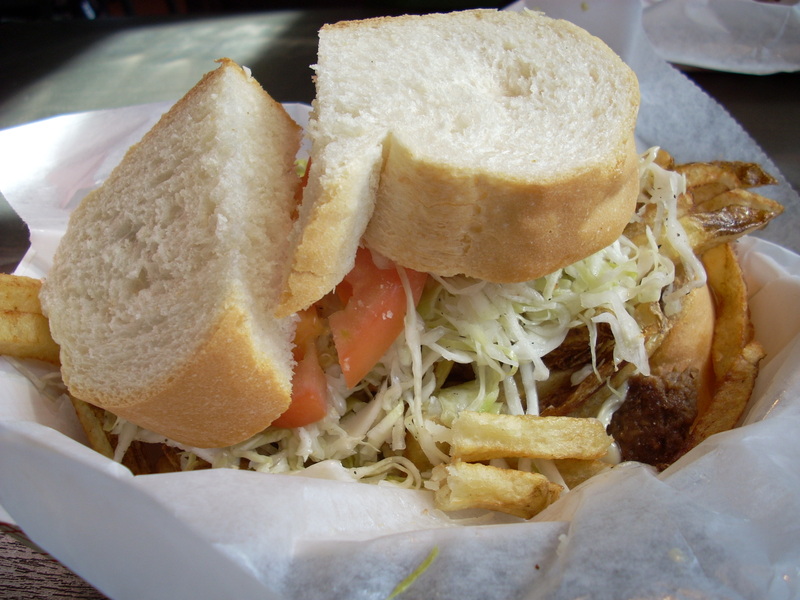 The “Second Best Selling” item on the Primanti Brothers menu is Pittsburgh’s signature sandwich, the Pitts-Burger Cheese Steak. This colossus is an ode to excess, concoted in a manner only a steel town could justify. The only thing that could make this sandwich better would be to remove the burger. Seriously. Primanti Brothers was the first stop on our summer burger/BBQ vacation and it was supposed to be the burger that set the course for the remainder of the week, but it fell flat. This sandwich was better than the sum of its parts, the slaw was so unique a tasty that I won’t think of cole slaw the same again, the bread was perfect, the fries stellar…the whole combination was mesmerizing…except for the patty which tasted manufactured. Look left…it just looks sad, pinned down below all of that topping goodness. The good news is my wife ordered the Black Angus Sirloin Steak Sandwich, which featured all of the same toppings but with delicious hunks of steak. Needless to say, she wasn’t going to share after she saw the look on my face after the bite of my burger, but I did get one good bite and man, that sandwich was terrific. 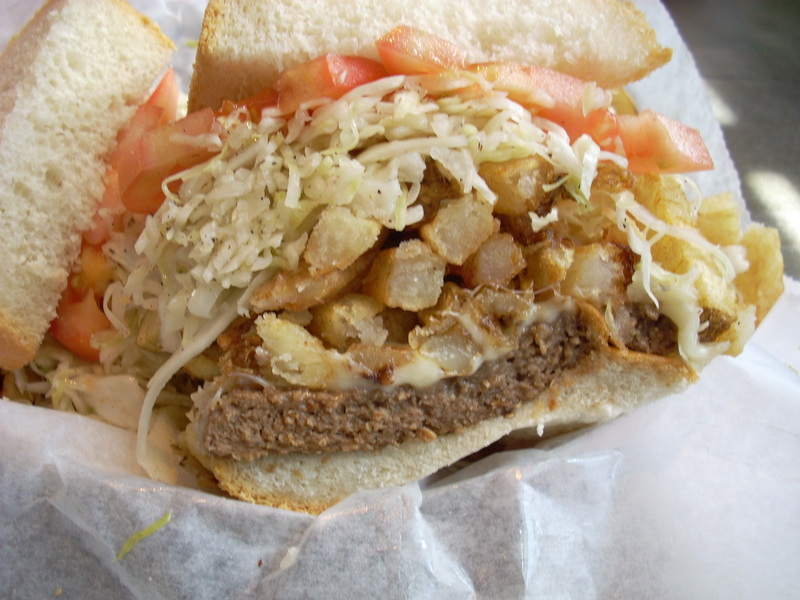 I am not going to pan Primanti’s because they are legendary. 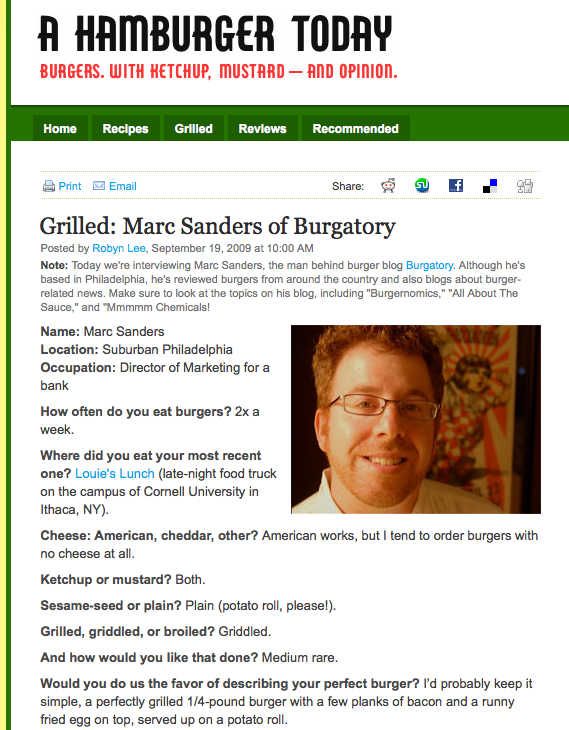 And, despite the notation that the burger is the #2 seller, it is widely reported that it is in fact the #1 seller (Serious Eats called their bluff earlier in the summer after noticing that there is no #1 seller listed on the menu). Somebody must be eating these. Here’s hoping they test out a Black Angus sandwich just once…I guarantee they’d switch allegiances. We did not eat in the original Primanti Brothers location in the “Strip District.” Things might have been different, we were out in the burbs. There are currently 13 locations throughout the metro. Pittsburgh has to be one of the nicest cities to visit in the US. Seriously. Leave your preconceptions at the city limits, the ‘Burgh features clean streets, a vibrant downtown, the best baseball stadium in the majors, Kennywood Amusement Park, the Warhol Museum, The Strip District and on and on and on. The number one best seller is beer. (Iron City specifically) It’s kind of like a joke. Jason is right about the number one seller being beer. And I think you are onto something about not visiting the original location. I have a one near my work, just off the Turnpike in Harmarville……NOT NEARLY AS GOOD AS GOING TO THE STRIP DISTRICT!!! If you ever come back hit up the original the atmosphere is great and if you haven’t met the cook there your really missing out….check out the video on travel channel and you’ll see she is quite the character and adds to the charm you don’t get at other locations. I ate at one in Greensburg last time my S.O. took me to PA. We usually go to the Strip District Primanti’s. I have to agree, the original has it all over the other. I’ve never had anything like it anywhere. The number one seller is IC Light, you have to be from the burg.